January began on a busy note, following a phone call from the soon to open William Inglis Hotel in Warwick Farm, Sydney. The hotel had been in planning and under construction for some time, however the addition of a day spa and fitness centre was only decided upon in November, so by the time I received a call in December it meant this pre-opening needed to be executed with utmost efficiency. Fortunately pre-openings are one of my favourite tasks. I actually enjoy rolling up my sleeves and being onsite to bring everything to life. Plus I love visual merchandising and interior styling! However, first things first. I needed to understand the location, guest demographic, hotel concept and owners vision so that I could choose the appropriate spa partner, curate a treatment menu, guide the brand identity and choose styling items for the day spa. Then the phone calls and planning began. Waterlily Skin Body and Spa was able to deliver an opening order and training within the tight time frame we had. I pulled together a critical path, delegated out various jobs so we could meet the deadline and began purchasing the most urgent of the 600 or so operational supply and equipment items. The Christmas break was the perfect time to go into creative copywriting for the spa menu, which was then immediately handed over to the Accor sales and marketing team for graphic design. I found the stock image below, which is perfect because it speaks to horses, racing tracks and brides... everything the William Inglis Hotel is about. The design of the day spa was mostly complete so no major changes to layout could be made, but a few tweaks in the selection of furnishings and the addition of more retail shelving was actioned. Arriving into what was still a construction zone on January 11th with 7 days to unpack OSE, set up, train the team, implement systems and processes and be photo shoot ready required great communication and coordination. Fortunately we were working with a great Accor management team so this helped us overcome the usual little disasters and defects that happen when construction is still in play. Our lovely therapists and spa manager were trained in the treatment protocols and we then ran a soft opening for two days which gave us the opportunity to practice and discover the weak areas we still had time to fix before official opening day. Very important and highly recommended for any new business. Overall this is a grand hotel and the spa is a beautiful addition, which I expect will become quite the destination for the Liverpool area. I myself look forward to returning for a spa experience when next in Sydney. Posted on February 2, 2018 by Sonja Sorich and tagged day spa design day spa styling spa spa menu spa treatment william inglis hotel william inglis day spa destination day spa wellness waterlily skin body spa. Whenever I am researching fitness trends there is one city that just keeps on popping up. New York City! So it made sense to add a 'fitness/wellness holiday' in NYC following the Global Wellness Summit. Here are some of the experiences and brands I had the chance to visit and try on. 1 HOTEL - I have been dying to visit the 1 Hotel in Brooklyn and was not disappointed. Its such an excellent model of a socially conscious brand with ecological design at the core of its philosophy. Every sustainable detail has been considered making it every bit authentic. The brand is part of the Starwood Capital Group and brainchild of hotelier Barry Sternlicht. There are currently 3 hotels in USA with 4 more opening internationally in 2018/19, which tells me this sustainable model is wanted by our guests and wellness warriors. BAMFORD SPA - Thinking I was going to have to visit the UK to visit a Bamford Spa you can imagine my delight when I discovered that the 1 Hotel has partnered with Bamford Spa. The spa offers a complete ecological perspective throughout its operation and it was nothing short of eco luxe exquisite. Next time I will definitely be treating myself with a treatment, but for this visit a retail bag of bamford goodies had to suffice. AIRE ANCIENT ROMAN BATHS - I was told if visiting NYC I had to visit AIRE, and so I booked my first 'night out' here and was not disappointed. This exquisite thermal bathing area is set below ground level featuring candles, music, various baths including a magnesium float bath, jacuzzi, thermal baths, cold plunge pools, a salt pillar for self applied body scrubs, steam room and a space for treatments. I added a salt stone massage to compliment my bathing experience. This brand is expanding across Europe and the UK and I can see why its such a popular choice for city dwellers as it offers an 'other worldly' relaxation experience in the heart of the city. 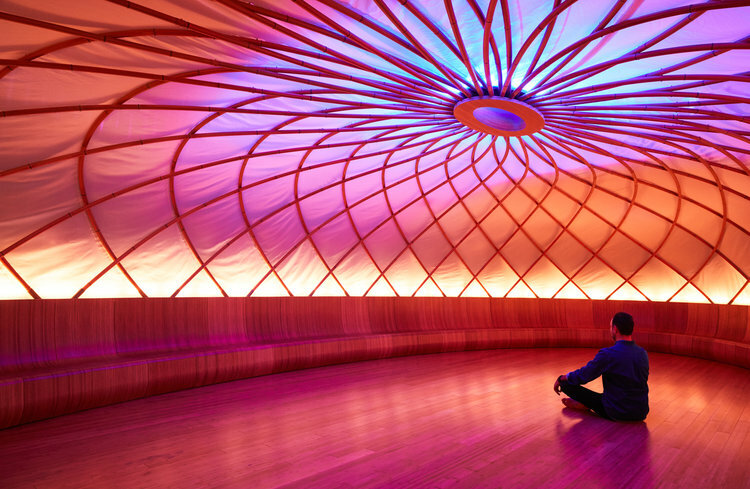 INSCAPE MEDITATION - This space features two meditation pods with specialised lighting. The variety of seating props were excellent, offering something suited to every type of person and their physical comfort. The class is introduced by a facilitator who sits in the centre but the class itself is lead by a recorded voice. The brilliance in this is being able to offer a class that is universally likeable, with good sound and without requiring an expert meditation teacher to be present. The retail store at Inscape offered an excellent range of boutique wellness products and a very nice relaxation area to hang out with a cup of fruit infused water and a book. WOOM YOGA - I jumped in a cab and went downtown for a midday yoga class in the Woom room. This centre offers yoga classes and sound meditations amidst a light show of patterns and imagery projected onto the wall. The music was quite loud and the lighting reminiscent of a night club in parts and I felt energised and engaged in the journey. Definitely worth a visit when in NYC. PELOTON CYCLING - This class is a convenient and immersive indoor cycling experience, streaming daily live classes from the NYC studio. This could be an excellent offering for the wellness hotel room concept. The advantage of this model is that guests receive a consistent standard of instructor. I see this model being perfect for homes and hotels. SOUL CYCLE - This class is a style of cycling that incorporates motivational and dance based instruction. It is a fun, intense workout in a dark room that is similar to a dance studio. Taking the cycle scene by storm its an excellent style of class to consider for any health retreat. TRAMPOLEAN CLASS - Ive often thought that rebounding classes need to enter the fitness arena. Well NYC offers trampolean and I really got a workout in this class. In a dark industrial style room we did all sorts of moves on the rebounder with the addition of hand weights and therabands to tone and stretch the entire body. This was an excellent low impact class with high impact results. The health benefits of rebounding are numerous as it cleanses the lymphatic system and exercises every internal organ and cell in the body, whilst delivering excellent aerobic exercise without impacting on joints. In addition to soaking and fitness classes I also did what anyone must do when in NYC, which was to go up to the top of the Empire State Building, see a show on Broadway and add in a spot of shopping in Times Square. I loved every minute in this vibrant city and cant wait to visit again. Posted on November 2, 2017 by Sonja Sorich and tagged 1 hotel brooklyn bamford spa aire ancient roman baths inscape meditation woom yoga peloton cycle soul cycle trampolean class new york city fitness wellness thermal bathing bathouse spa health healthy hotel. Following the Global Wellness Summit, I wasn't going to miss the opportunity to join a post summit trip to the newly opened Chable Resort in the Yucatan region of Mexico. Ten years in the making, Chable first opened its doors in November 2016 and was already heralding international acclaim, so I was certainly looking forward to the journey. 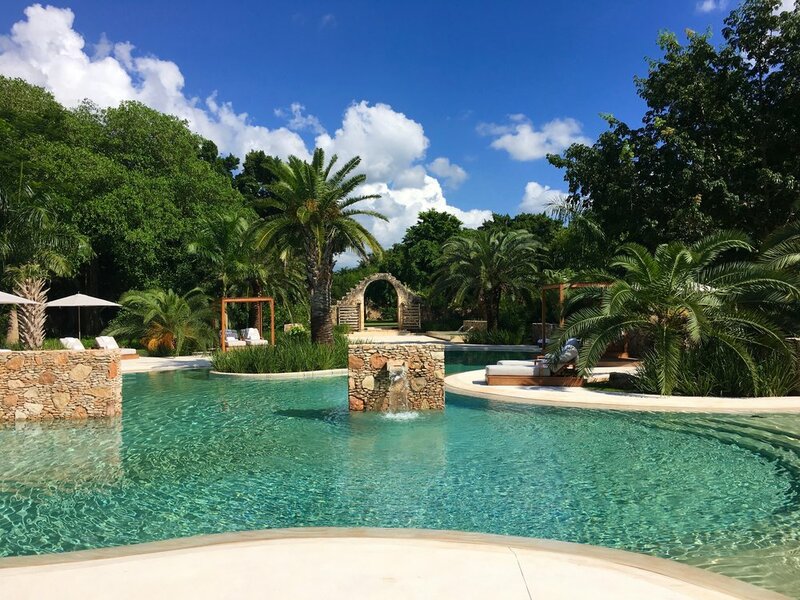 Based on ancient Mayan culture and set on the most exquisite 750 acre property, complete with remnants of ruins to remind one of centuries past, a beautiful blue hacienda houses the reception, retail boutique, a bar and some other spaces. Beautiful furnishings, artworks and sculptures grace each room and meet us upon our arrival to this other worldly resort. After check in I am escorted along a winding path to my private villa, set in amongst the jungle. The room is spacious and well appointed with a bathroom that connects to the outdoors, a comfortable king size bed and sitting area, along with a private plunge pool and terrace. I am in heaven! After a very social 10 days of travelling I am ready to rest and sink into the surrounding nature. A light lunch is served at the restaurant that sits by the most magical pool, before I make my way to an afternoon in the spa. The treatment menu is like nothing I have ever seen before so I book 8 treatments in the space of 3 days. I want to take in all of this mayan healing. I have Janzu, Rain Goddess Ritual, a Bio Energy Lift Facial, Mayan Herbal Compress Massage amongst other things. The menu also offers a Traditional Ceremonial Temazcal, however unfortunately the shaman is unable to perform the ceremony on the needed day which gives me a reason to return. I could hardly imagine going to stay at Chable without having at least one spa treatment from this amazing spa menu. The stand out feature of the resort for me is the day spa, but then perhaps I am biased as I am sure a cigar smoker or tequila drinker might say otherwise. In any case the central spa facilities are stunning, with treatment rooms branching off along a circular path overlooking the central cenote, which is a fresh water hole considered to be sacred in Mexican culture. Having other facilities such as the fitness centre, a café, swimming pool and yoga deck connected to the day spa keeps the wellness activities nicely connected. There is also a café located at the spa which offers a complimentary daily tasting of small bites. The men’s and women’s change room each have an outdoor thermal bathing area with sauna, steam, salt room, showers and hot and cold pools. Near the entrance to the relaxation lounge is a small open room that displays the local ingredients and herbs that make up the spa products and smoking ceremony mix. A large white conch shell set in the middle of a pond resides in the centre of the spa. Here and before my first ritual I was guided across the stepping stones and into the centre of the conch for a Mayan intention setting and smoking ceremony. Depending on the ritual chosen, some rituals began with drumming, sounding of the conch, rattles or other instruments. Definitely the most unique ritual experience I have encountered to date and I loved it! The resort had a visiting yoga teacher who offered a number of classes during the day that included yoga, meditation, guided visualisation, journaling and talks on mindfulness. Most classes were on the yoga deck that sat on the edge of the sacred cenote. There were also another couple from Spain that facilitated a qi gong class accompanied by live spiritual music. This was both unique and wonderful. Led in the courtyard under the expansive shade of a large tree I was transported to another place with the movements, breath and sound. Chable has found a way to successfully offer wellness alongside other cultural traditions of Mexico such as a cigar bar and Ixium, the fine dining restaurant, which has a tequila collection of over 3600 bottles. The food menu’s were not entirely wellness focused, but they were small portions of Mexican style food and the staff always enquired as to whether I had any dietary requests, so they were ready and able to cater to dairy, sugar and gluten free options. Overall, Chable Resort has found a way to merge authentic wellness, mayan spirituality and healing, along with traditional Mexican culture, which is what makes it the perfectly balanced wellness getaway. Posted on October 21, 2017 by Sonja Sorich and tagged chable resort wellness traveller wellness redefined wellness retreat mayan culture spa design cenote temazcal ceremony mayan healing spa consultant. My trip to Japan earlier this year, along with two other client projects, a couple of random meetings and then an invitation to Peninsula Hot Springs for the launch of Synthesis skincare, have all drawn me into the world of thermal bathing and hot springs. Therefore in following this new path of discovery I decided to join the Global Thermal Think Tank, which was a tour of 4 hot springs resorts in the USA right before the Global Wellness Summit. Meeting with 20 other hot spring resort owners, developers, suppliers and enthusiasts we began our tour, with a two night stay at Glen Ivy Hot Springs in California. This resort offers a variety of bathing pools, a grotto, mud bath, cold plunge pool, magnesium pool, sauna, steam room and day spa with a menu of assorted treatments and therapies. A well stocked retail store, cafe, restaurant, yoga deck and labyrinth also add to the properties experiences. The itinerary for this tour included free time to soak in the pools and explore the various facilities and activities. Glen Ivy management organised delicious health fulfilling meals and I had the opportunity to meet my co-travellers and learn of their interest and connection to this industry. In addition we had group forums, presentations and lectures in the schedule. Our next two day stay was at Two Bunch Palms, an oasis in the middle of the Californian desert which is quite literally named after the two bunches of palms that sit in the middle of this landscape and mark the hot springs. We were welcomed with an intention setting and smoking ceremony lead by the resident shaman, and then had time to soak and relax before meeting for dinner. The following day various presenters talked of the history, trends and progressions in the hot springs industry. Our final destination was two flights and a road trip away to Ojo Caliente located near Sante Fe, Mexico. Nestled in a valley on 1,100 acres, Ojo is deemed sacred by the Native Americans of Northern New Mexico. The legendary waters here have been soothing body, mind and spirit for centuries and are the only hot springs in the world with 4 unique, sulfer-free mineral waters. Throughout history, people have used thermal and mineral springs for bathing, healing, socializing, and spiritual reasons. Those traditions are the roots of today’s spa industry, and are finding a resurgence of interest as consumers increasingly seek authentic, natural, and place-based experiences. There are over 26,000 establishments in 103 countries that have wellness, recreational, and therapeutic facilities and services built around thermal/mineral springs. Collectively, these establishments earned more than $50 billion in revenues in 2013. Only 6,500 of these establishments offer spa-related services such as massages and facials and because they earn much higher average revenues, thermal and mineral springs establishments that offer spa treatments account for nearly two-thirds of industry revenues. Asia leads the world in thermal/mineral springs revenues at $26.7 billion, with the two main markets—Japan and China—accounting for 51% of global revenues. The Asian market is dominated by the thousands of onsen in Japan and the ongoing massive investments in hot springs resorts in China. The second largest region is Europe, estimated at $21.7 billion, with a mature industry of sanatoria, health resorts, and thermal stations that use thermal and mineral waters primarily for therapeutic, curative, and rehabilitative purposes. As the renewed interest in the special properties of thermal and mineral waters continues to pick up momentum, we expect to see a growing number of businesses built around springs in countries where the industry is less developed. In the well-established markets in Europe, many countries are refurbishing their facilities and modernizing their offerings to appeal to modern wellness consumers and travellers. I certainly now know that my preference from this point of discovery will to be have a combined hot springs and spa resort experience. Its just so fulfilling to have a connection to a life giving source of wellness whilst being outdoors in the sunshine or under the stars. And with the addition of a day spa ritual, there really isn't too much more one could want. Posted on October 2, 2017 by Sonja Sorich and tagged hot springs thermal bathing mineral springs wellness spa day spa health resort sanitorium sauna steam room grotto mud bath cold plunge pool magnesium pool sacred site spirituality cleansing spa tradition therapeutic curative rehabilitative bathing healing connection ojo caliente two bunch palms resort glen ivy hot springs resort sunrise springs spa resort.